How do I adjust my Colour LaserJet 5550 printer for the best colour composite? Cartridge Save is a most dependable web based expert in cartridges for HP LaserJet 5550 printers throughout the United Kingdom. We will only ever sell toners that are compatible with your laser printer, which means you won't need to be worried of them resulting in damage. To find LaserJet 5550 laser cartridges you never have to get worried about, shop at Cartridge Save now. For an online shop promising helpful customer care plus the lowest prices for HP laser toner cartridges, then clearly Cartridge Save is the supplier for you! You get complimentary delivery with anything purchased at Cartridge Save! Cartridge Save take fast delivery seriously, which results in 98% of all orders arriving the following day. You'll have peace of mind when you purchase with Cartridge Save thanks to our company's extensive money back promise, which is standard on everything. So if you experience troubles with your HP LaserJet 5550 toner cartridge within 30 days after purchase you just need to send it to us for your total reimbursement. Shop with certainty using Cartridge Save! 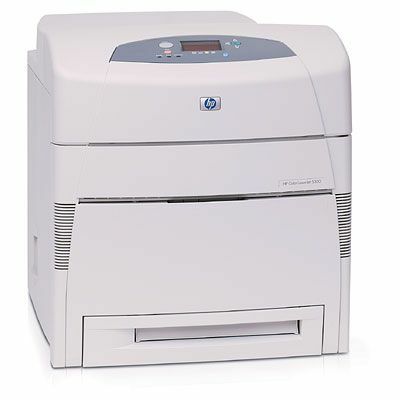 For anyone needing speed in both colour or black and white prints, the HP Colour LaserJet 5550 is the printer for you. The 5550 is a laser colour printer that is able to keep up with the demands of anyone who needs to print at speeds of 28 pages per minute and will meet the requirements of a small to medium-sized business. Clear colour photos can be printed in a resolution of up to 600 x 600 dpi and HP ImageREt 3600 is used to reproduce crisp colours. This technology can also enhance images through advanced colour blending and by using true-to-life colours. To manage information, this printer makes good use of a MIPS 533 MHz processor and 128 MB of RAM. This printer is big and will take up a decent amount of space in your office or home. It has dimensions of 57.65 cm in width, 70.35 cm in depth, and a height of 64 cm. This large printer is also very bulky at weight of 51.80 kg. To monitor prints, an LCD screen is built into the printer and is easy to navigate. There are three different types of connections available and include USB, parallel connection, or Ethernet cable. Furthermore, It should be mentioned that HP 5550 toner is built for heavy use and can have yields of up to 13,000 pages. Duplex printing is standard with the HP 5550 and allows you to print on both sides of page. This will increase savings and reduce paper expenses. Even though this printer comes with 128 MB of RAM, you can still upgrade it for better performance. The 5550 printer can receive up to a 512 MB upgrade. This is installed using the memory expansion slots that are available on the printer. Printing on cards, labels, plain paper, heavy-weight paper, high-gloss paper, recycled paper, envelopes, and transparencies is also possible on this HP model. Changing your HP 5550 toner won't take long thanks to HP's considerate design with easy access to their holding bay. This printer does not come with a fax machine, copier or a scanner, which should not be the deal breaker on the HP Colour LaserJet 5550. However, a disadvantage that should be mentioned is the price. This printer is expensive, but may be worth its price due to its extremely fast printing and workhorse abilities. In addition, the cost of replacing the HP 5550 toner should be factored into the running cost of this printer in a busy office.